If you look at my clean eating chart, it’s highly unlikely that you’ll see a dish with meat in it. I mean, sure… I gave up red meat a lonnnnnng time ago, but I still partake of the poultry… and if I travel someplace with nice seafood? Well, I can’t be held responsible for what I may do. But at home, on my everyday schedule? It’s not likely that you’ll find any form of meat. Maybe once or twice a month. I know, I know… someone out there’s gasping for air. Trust me… I have my reasons. I’ll share them with you, but only on one condition – promise me that if you wind up agreeing with me, you’ll take my approach into consideration. I’m not issuing any orders… but you gotta promise to at least consider what I’m saying, here. Everywhere you turn, there’s a burger available for cheap. If you’re lucky, you might even have a $0.35 burger day in your area. Burgers are going for cheap everywhere, but no one asks the question of “why is this meat so cheap? How are they able to offer this for so little?” In fact, I have another question that I think is worth asking: what is the difference between the cheap product and the “cream of the crop” beef, and is the difference really so large that such a difference in price makes sense? Let’s take a brief look at how beef is raised. Obviously, beef comes from cows. If you pay any attention to the commercials, you’d presume it comes from happy cows. In a pasture. With always-beautiful blue skies. Probably from somewhere out in California. They’ve got lots of wandering room, and lots of little dandelions to chew on if they so desire. I hate to break it to you, but things aren’t quite how they seem… much like most things in the food manufacturing industry. A cow, raised healthily, does grow in a pasture, eat grass, walk and run at his own leisure and is devoid of antibiotics. He will grow to be a few tons, be big and strong, develop lots of healthy muscle to be divided up and delivered to wherever you purchase your beef. The problem, however, is that most cows in the US aren’t grown this way. On your average farm, you’ll find cows. Lots of ’em. You won’t find green grass, though. You won’t find pastures, dandelions or “happy” and “healthy” cows. You’ll find cows packed in tightly in a small space – meant to restrict movement – feeding on corn. I won’t get into too much deeper detail – because I didn’t set out to gross anyone out with this post – but I will explain what’s so wrong with this. Take it a step further, though. Because the cows aren’t eating what they’re supposed to be eating, they’re unable to fight off infection (sound familiar?) and illness. So, instead of saying “Ohhh, we’re making the cows sick, let’s go back to giving them what they’re supposed to have,” the industry says “Give ’em antibiotics.” The anti-biotics can’t take care of everything, so the cows have to have a hole created so that a “ranch hand” (literally) can reach their hand inside the cow and pull out the infectious and indigestible product. Any antibiotics may help with illness, but not infection… so the meat is thereafter cleaned with ammonia. I’m not making this stuff up. Really, I’m not. So… am I writing with the goal in mind to turn anyone away from beef? Of course not. I’m a believer in the idea that man has subsisted on meat- though, not as much as we eat today – for quite a long time, and though there are “studies” that suggest man has never eaten meat.. there are also “studies” that suggest otherwise. Either way.. we’ve never eaten as much meat as we do now because it was never quite so cheap. When it comes to time and money, beef has never been so easy for us to acquire. $0.65 cheeseburger night’ing it. Value meal’ing it. Giving beef away with your purchase of tires. It’s just easy to get… so easy, in fact, that there’s rarely any time to question the quality of the product. When you stop to question the quality of the product, you find out things like the above, though. The cheapness and availability of beef nowadays has turned properly made beef into a luxury. Think about that. Cheap food – once again – has turned properly made food into a luxury... to the point where people don’t even want to address issues of quality. That’s a huge problem. What is my point? My point is, the amount of money we spend on inexpensive beef every day could be saved and used to purchase high quality, properly grown beef. It may cost more, but if you can avoid the excess fat, antibiotics and hormones in your food, why not try? This is where the “eat less” aspect comes in. If you go from eating beef 18 times a week to, maybe, 6 times a week in healthy portions… are you going to feel it that much in your pocket? Now, if you don’t have access to healthful beef, then you have a decision to make. Do you want to limit your intake of beef? Cut it entirely? Do you even care? Note: Subscribers, you’ll need to visit the site in order to view the video attached. Giveaway: Come Let Your #FitnessGlo and Work Out Anytime! Your post (as usual) is full of straightforward truths. This, among many other revelations edged me out of consuming meat entirely. I know you’d been making the conversion over… how’s it treating you? What revelations did you come across? This is exactly why I do not eat beef often. I mostly focus on chicken or turkey. Or if I must have the taste of beef I am going for the grass-fed,organic kind which is expensive. So that in turn means that I will not be eating tons of it. Great post. The part about the meat being rinsed with ammonia, yuck! I don’t think I will be able to get that out of my head. I first started questioning the meat industry after browsing a copy of “Skinny B” in Barnes and Noble. I decided that day to give vegetarianism a try. I was meat free for six months until I went home for Christmas and ate my Grandma’s fried chicken. *SMH*. I would love to stick with the a nearly meat-free diet, but I know I have to deal with some underlining food issues first. I own “Skinny B” and I enjoyed it, but with all books… there’s the parts you can take away, and the parts you absolutely need to leave behind. The problem that I have with “Skinny B” is the fact that it advocates a lifestyle of abandoning meat and animal by-products by… substituting them with processed food. Out of the frying pan… into the fire. Not interested. However… the take away is DEFINITELY the writing about the meat industry. THAT part was pretty interesting. I gave it up entirely for many years and wouldn’t touch red meat of ANY kind. In the last year or so, we’ve had it once or twice. But its the organic grass fed stuff. But this post has me wondering– how “grass fed” is it? I’ve heard they can slap nice looking labels like ‘no antibiotics’ and ‘free range’ on chicken, but their lives are not as idyllic as those phrases imply. Hmmmm… considering going back to a pescatarian lifestyle again…might be hard for the dude, though. He loves his poultry. Vegetarianism is treating me quite nicely, if I might say! I transitioned for about 6 months and red meat was actually the first thing I gave up. As you stated, the actual atmosphere in which most of these animals are held, does not reflect the general public’s understanding of where the food actually comes from. There is no grass, but there are plenty of drugs and harsh cleansers. And, I’m by no means a ‘queen of morality’, but if you ever witness (even via TV) the conditions of some of those “meat factories,” it’s quite disturbing. I also became aware of meat’s inflammatory capabilities, once introduced into our bodies. Specifically, red meat! While most can naturally manage this process, some of us with more sensitive immune systems (MS in my case) – do not recover well. So, I had to (ground) chuck the deuces, lol. Ahhhhh, that’s another facet to it. 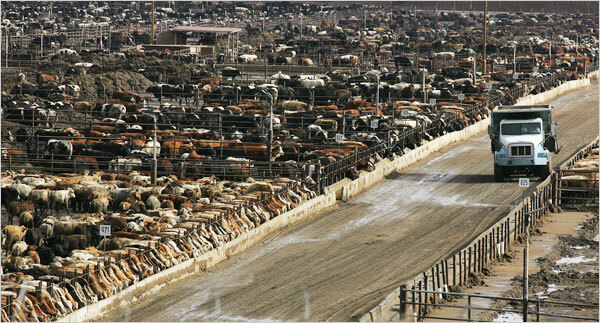 I don’t want to be an advocate of people abandoning meat completely.. but the digestive issues are astounding. I know that I, personally, wouldn’t be able to do it. I’m mad at your stand-up routine, here. Go eat a carrot, already. LOL! I don’t eat beef often, but this is good information. I love steak but I wouldn’t eat it EVERY DAY! That’s just too much. You have to diversify your proteins in my opinion, but you cant beef good quality beef, or andy good quality protein. Excellent posting. I just caught a sale last month on Whole Foods Grass Fed Beef. It was 50% off and their website tells you exactly where your beef comes from. So I have some in the freezer for when I want it but I usually don’t eat much beef. I have been beef free for about 10 years now, and I’m only 25. What started off as a game to lose weight (which neithe of us did) while being a teenager working at McDonald’s has led to my own personal triumph. I too read Skinny B and found what they said about beef to be a good take away. I have also considered full-on vegetarian (not vegan) and even recently tried a month of no-meat but I was ill-prepared for the transition (pizza isn’t ok every day, just because it has no meat!) As I struggle to get back on track with my weight-loss goals, I do hope that meat plays a smaller role in my daily consumption. My husband is from Ghana, so I have been there twice. I was astounded – I’m telling you, there are no words – in the differences in consumption over there. – When my husband’s father died, during the funeral reception we all pitched in to buy an entire cow, which was purchased from a local farmer then slaughtered and prepared ON SITE. – Driving along the street, going home from work, you can buy live, healthy, untampered chickens to eat that day at home. Again, you slaughter and prepare them yourselves, and you look the person who raised that chicken in the eye when you purchase it. – In Ghana, peanut butter is made from peanuts, and nothing else. I asked my husband why it had like an inch layer of oil on top, and he said, “Peanuts have oil in them. That’s natural, and it helps preserve the paste.” I was shocked. In fact, we keep “groundnut paste” in our house all the time now, my mom saw it and thought it was peanut butter gone bad and threw it out! It is also not sweet or creamy at all – it is grainy and peanuty. Coming home, I suddenly understood how flawed our system really is. My husband can hardly tolerate processed foods, so we eat fresh almost all the time. Of course, I haven’t lost a single blessed pound in 6.5 years of marriage, but with the help of your blog I am now. Duplicating my husband’s favorite foods is not difficult, but I’m realizing now that the flavor may be there, but the freshness and high quality he was getting at home cannot be duplicated in the States. It makes me so sad – Ghana is considered a “developing country” yet our government makes it legal to feed us what is basically poison. Shameful. I stopped eating beef 13 years ago & people still try to get me to taste a steak or a burger, but I can’t even taste beef without getting sick! Funny thing is, I stopped eating pork around the same time & was able to return to eating pork 5 yrs ago with no illness? I still don’t eat pork all the time, but I do have it every now & again…but beef…never again in this lifetime! And I used to be a beef addict! And I’m sure a fresh cow may be tasty, but I won’t know it…I can’t even eat goat, no red meat for me! But I do know people who only buy beef from butchers or whole foods and they say its the best stuff on earth! I know there’s something to spending more for quality, so I try to reserve my pork eating to great cuts for good places or just buying my own! Everything we buy cheap is a mess as far as I’m concerned…great article!